Intervention provides a reliable cue to veridical causality. 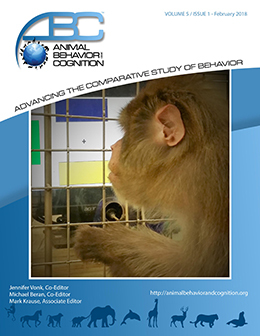 Just as an experimenter manipulates variables to distinguish cause and effect from mere correlation, so might a rat learn differently about the effects of its own actions. However, theory remains vague on specific predictions. The present study asks whether and how producing a conditional stimulus by lever contact alters what a rat learns about that stimulus. Despite the theoretical pressure among theories of causal reasoning for an effect of intervention to hold, the effect we found was not in standard goal-oriented response variables, but in a general activity measure, and so not readily interpretable by typical theories of causal reasoning. We propose a viable explanation for this pattern in terms of multiple foraging strategies. The primary contribution of the present results is that they pose three challenges to theories that concern how animals deal with cause and effect: 1) to resolve present ambiguities regarding predictions; 2) to situate causal cognition research in specific ecological contexts, such as predation; and 3) to look beyond goal acquisition, to the rest of the animal's behavior, including general activity. We present one potential solution in alignment with behavior systems approaches.